The ultimaker printer is one kind of reprap, as well as standard three- axis rectangular coordinates 6. This rule should be unnecessary! Anyhow, now that the major obstacle was overcome, just being able to get a repeatable print, it was time to start looking at secondary failures. Kind regards Dual yes, Tri no. A RepRap must be able to produce more than half it's own parts, typically the mechanical structure. Or, if I just hook up the ramps ground and pin 6 pwm wire to a voltmeter and try M106 P2 S255 or M106 P2 S0 there is no change in the voltage reading. Broadly speaking, for equal wattage applications, higher voltages mean lower currents, and lower currents mean less power lost to heat. After moving the printer to the basement I could finally get consistent prints, not error free prints, but repeatable prints. It can only be installed in one direction - see images for details. Have you guys found a solution to the problem? If D9 is not set in the firmware configuration to either of those 2 settings above, I can control it via M42 P9 S255 and the fan works fine. How many extruders can ramps support? 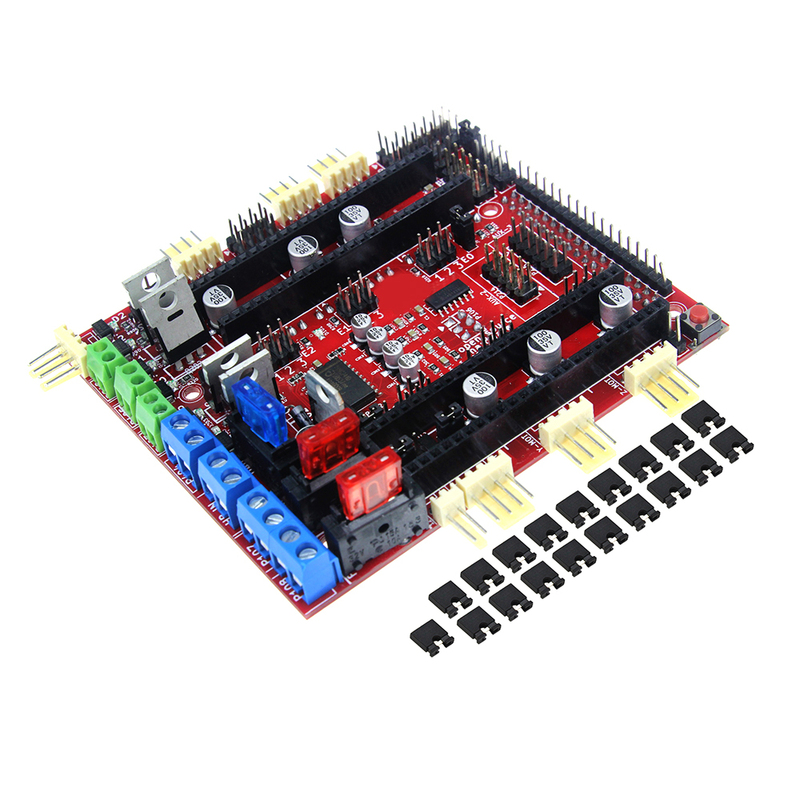 While the RigidBot board is also an integrated design, this board will have a different form factor and different cable connectors, so you will still have to adapt it to suit the RigidBot. I used the Fan Extender to make it possible to have my hotend heatsink fan to turn on and off as the hotend got hot and cold - I do not want this fan to just blow all the time due to noise. Which now I'm wondering why M42 I can turn it on, means it's not protected, aka not defined anywhere. I get good prints one time and horrible prints the next. Have some of these laying around here, too. I'm a little confused as to what we are trying to cool. There should be a tiny + to show it. I still recommend making up the sidecar board for the additional Power Connectors. I ended up making a lot of extension cables. I assume this is because you're using the fan extender. Eventually I got frustrated, and tired of having the printer sitting in the family room so I moved it downstairs to my workroom. That means remove both the power and usb cords. This appears to be a problem with Sprinter experimental. I had to do a little soldering but for the most part the kit was plug and play. One of them is on. 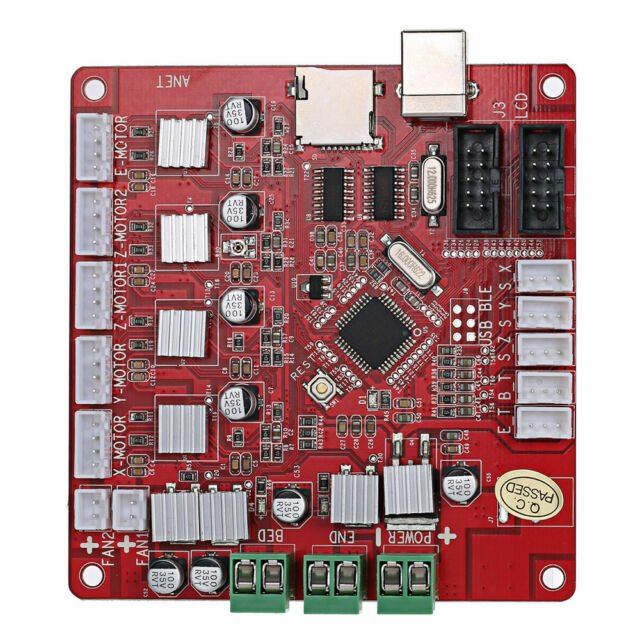 After I connect to the board with repeater host, when I try to modulate the brightness of led with M106 P2 S255, there is no increased brightness. M106 doesn't turn it on either. Now is also a good time to screw in the Heated Bed and Extruder Heater. Setting parameters of the firmware 3. Apparently the software knows how much fans are defined! These parameters indicate the pulse the axis need when operating 1mm. If you look into you pin layout file, e. Double checked everything and even dragged out the oscilloscope for a look. I literally just had to plug the fan into the output and enable cooling in slic3r, that was all. It turns on over 120 Celsius degrees, and turns off below. Can fan be added to Ramps? 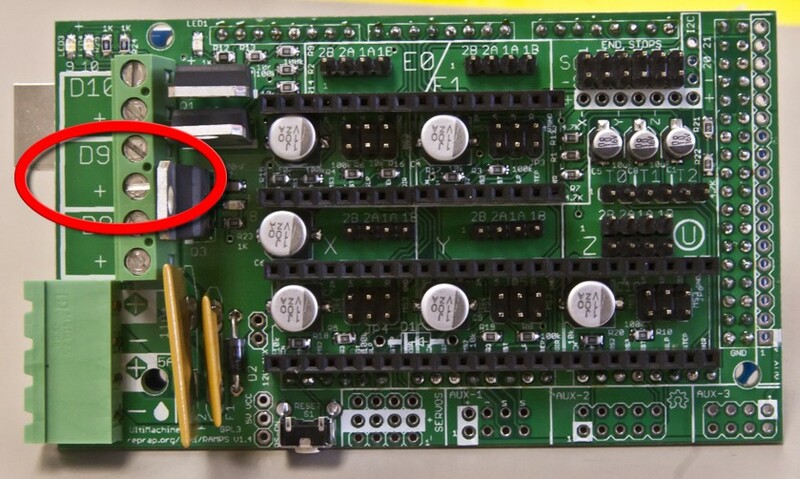 From there you can find how to set the pins for the fans, provided that there are free unused and exposed so that you do not have so solder directly to the microprocessor. Now how about the electronics. 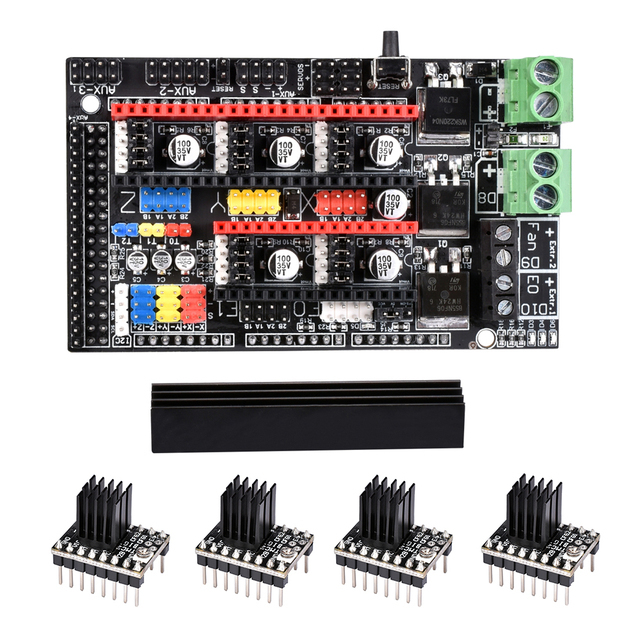 But the printrboard doesn't have removable A4988 stepper drivers, so you would need new steppers anyway. I noticed you wired the Extruder Heater E0 to D9. If you use only one extruder, you can connect the fan to the 2 pins in the middle of the 6 blue output pins. If you connect 24V with D1 intact you will most likely permanently damage your Arduino. To clarify, I use extruder cooler driven from D9. So, to run the heated bed at 24V: The steps below are theories explained throughout this document, but are as yet untested. Use Type 34 if you have a Fan Extender, otherwise use 33. It should now look something like: 4 To kick things off and get the wires out of the way, hook up your Limit Switches to the Sidecar. The + side of the plugs is, when looking at the front of the connector so the wires protrude behind the plug, the right hand side of the plug. I use Pin 4 and 6, but yours might be different. Do you use a heated bed.